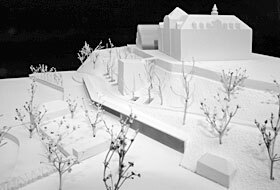 The design submitted by Hein Architects from Bregenz in conjunction with landscape architect Thomas Steinmann from Winterthur won first prize in the architecture competition. Protection mat ISM 50 provides the first layer of the ZinCo system build-up "Roof Garden" and is installed onto the root-resistant bituminous waterproof roof membrane. Because it is directly connected to rocky terrain, the building and the green roof had to be structurally designed such that they could withstand the slope pressure. The railing base plates GB for fixing without roof penetration are filled with Zincolit® Plus, as are the Floradrain® FD 60 elements. Around the atria, the ZinCo guiderail base allows for the railing to be installed without penetrating the roof waterproof membrane. Whether it's a pathway or plant beds, the uninterrupted underlying drainage level ensures drainage even along the considerable distance to the narrow sides of the roof. There is no limit to design options using paving stones and slabs, even on a roof. Small maintenance vehicles can be driven along the pathways too. 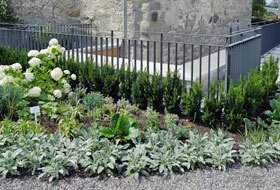 Hedging plants provide a border around the Comturey Tower. Even after only one vegetation period, plant growth is lush. Numerous seating elements are an invitation to linger and to admire the splendid view across Lake Constance. 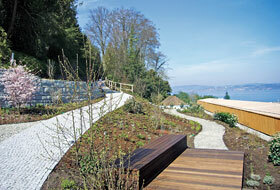 Towards the hillside, 2 m of substrate was spread in parts in order for the landscape to be modelled as required. Travelling by boat across Lake Constance to Mainau Island you will be treated to views of floral splendour, a Baroque castle and – since March 2014 – the re-designed harbour area on the lakeside around Comturey Tower. The new single-storey Comturey building has an almost 80 m long glazed façade overlooking the lake while its three other sides disappear into the surrounding landscape and its roof is accessible as part of the landscaped gardens. 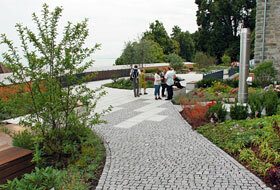 Thanks to the ZinCo system build-up "Roof Garden", the Mainau landscape architects had considerable freedom when designing and planning the almost 1500 m² roof. They have created a new paradise for visitors to this unique location. Mainau Island is approx. 45 hectares in size and is the third-largest island on Lake Constance. It has developed over the years into a combination of botanical gardens, historical castle gardens, a venue for cultural events and a location for international meetings. The island is open all year round, welcomes about 1.2 million visitors a year and is the most significant tourist destination on Lake Constance. Mainau is owned by the Bernadottes, a noble family of Swedish descent and has been a listed structure since 2003. The family continue to develop the island with much thought and sensitivity. The Comturey Tower is part of a mediaeval fortress and was apparently inhabited during the era of the German Teutonic Order from 1200 to 1240. It has a vaulted cellar as a pantry and a wine press house. As the old Comturey-Keller building from the 1970s no longer met current needs and requirements, the decision was made to run an architecture competition. The aim was to re-design the existing harbour area with its numerous individual buildings, developing it into a new and attractive entrance area. The winner was a design by architects Hein from Bregenz (Austria) in conjunction with landscape architect Thomas Steinmann from Winterthur (Switzerland). "Right from the start of the planning phase, the aim was to merge the new restaurant building visually and from an optimum-energy point of view with its surroundings", said Countess Bettina Bernadotte, CEO of Mainau GmbH. "With the exception of the glazed façade, the building more or less fuses with the gardens". The concept provides for three sides of the restaurant building to have a direct connection with the earth and for the existing parkland to be extended onto the roof of the building. This allowed for the creation of an additional park area, albeit a small one. The planned continuation of the "hydrangea path" over the roof as the main walkway to and from the harbour was yet another reason for choosing this design. The topographical position of the new restaurant building at the sandstone cliffs around the Comturey Tower resulted in a narrow but very long roof with an approx. 1 m high parapet running along the entire front edge. This parapet and the adjoining canopy are wood panelled. They were specifically designed without an incline due to the water retention irrigation system required for the intensive green roof. The roof area does, however, require a reliable drainage system and one that can function over a distance of 40 m given that the roof can only be drained along the two narrow sides. The special hillside location added an extra and unusual aspect: the weight of the building including the green roof had to be calculated such that the building could withstand the slope pressure. Therefore, the green roof could not be too heavy or too light. 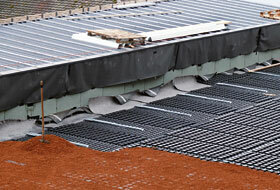 The right solution in this case was the ZinCo system build-up "Roof Garden" in conjunction with Floradrain® FD 60. 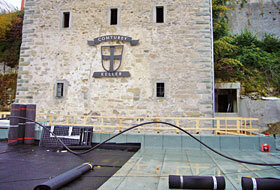 The green roof build-up on a multi-layer, root-resistant bituminous roof waterproof membrane began with the installation of protection mat ISM 50. The next layer was the drainage and water retention element Floradrain® FD 60 filled with the purely mineral crushed brick substrate. This provides for a high level of water storage and for the drainage of excess water through the underlying channel system along what is a considerable distance. The next layer is provided by filter sheet SF and then about 30 cm of system substrate "Roof Garden", which is part humus and part mineral. Towards the hillside, the substrate depth was increased to 2 m in some parts in order for the landscape to be designed and modelled as required. In this case, Zincolit® Plus was used as a sub-substrate. This multi-functional build-up provided the right foundation for the intended surface areas on the roof. These areas are primarily pathways but due to the load-bearing capacity of the system build-up they can also be used for small maintenance vehicles such as a small road sweeper. 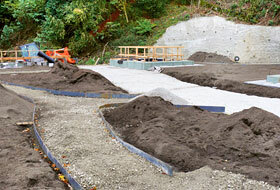 A base course of gravel as a foundation is used on the drainage layer and system filter. In addition, individual wooden podia have been installed for use as seating or for admiring the view across Lake Constance. 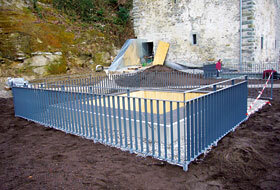 Railings were required around the various atria and for the accessible area at the front edge of the building. ZinCo provided an intelligent and structurally-advantageous solution for this: The guardrail base GB is integrated directly into the green roof build-up and is kept in place by the superimposed load. The rail support is attached to a specially-designed steel profile. The ABS plastic plate and the underlying metal reinforcement profiles provide for an even load distribution. As a result, the railings which were custom-made by the fitter were secured without the need to penetrate the roof, therefore eliminating any weak points in the waterproof membrane or thermal bridges. Thanks to the continuation of the "hydrangea path" over the roof and down to the waterside garden, the pathway is of course lined with numerous examples of this popular, ornamental flowering plant. Apart from that, the various flowerbeds are filled with many perennials and trees. More than 12,000 plants and over 200 species were planted on the roof. 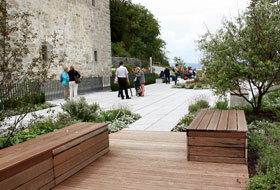 Just before the Comturey Tower, the pathway broadens into a wide area that invites the visitor to linger a while and soak up the captivating view across Lake Constance. Umbrella-shaped small trees and perennials provide shade for visitors seated on the benches, from where the north shore of the lake and the lush plants of the roof garden can be admired. From the roof garden, your eye is drawn to the lakeside beer garden and its new single-storey annex where a green roof is also going to be installed. 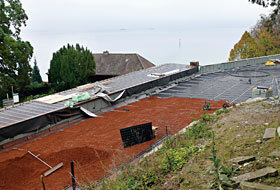 In this case, it will be an extensive green roof with multi-coloured sedum plants based on the ZinCo system build-up "Sedum Carpet" with Floradrain® FD 25. "Beyond the horizon … undiscovered vistas"
In line with this annual motto for 2014, Mainau is opening up new vistas and is merging the surrounding landscape into the design of the parkland. One of these new "vistas" was achieved with the launch on 29 March 2014 of the roof garden on the Comturey restaurant in the re-designed harbour area. This new parkland with its view across Lake Constance to Meersburg and further to the Alpine summits, particularly throws into relief the charming landscape around Lake Constance. Again and again you will discover the new and the unknown, both near and far, because this technically superb solution and the sophisticated design of the green roof on Mainau Island is simply second to none.